Before the HTML5 History API, developers had to use hash URLs to change the current URL (window.location="#hash") without reloading the page and create client side routing in Single Page Applications (SPAs). Nowadys and thanks to HTML5 History API, we can create complex SPAs and fully fledged apps that run on the client side without URL hashes. Most client side libraries such as React, Vue or Angular etc. make use of the History API to create advanced routing which abstracts the inner details of this API in a high level interface that makes client side routing a breeze. The window object has a history object that represents the browser's history. 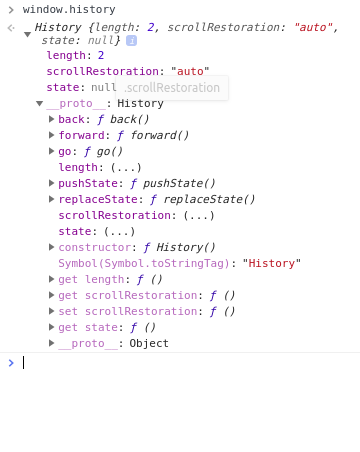 The object provides many methods and properties that let you manipulate the user's history jsut like you would manually do using the browser's back and forth buttons. go(): load a page, by its position index relative to the current page (index 0), from the session history, e.g. window.history.go(-1); is equivalent to calling back and window.history.go(1); is equivalent to calling forward. Before running the previous code I have already visited https://www.techiediaries from the address bar. Uncaught DOMException: Failed to execute 'pushState' on 'History': A history state object with URL 'https://www.google.com/' cannot be created in a document with origin 'https://www.techiediaries.com' and URL 'https://www.techiediaries.com/path2'.